Map of the area around the Russian supply depot at Posen, in Poland. Double click on both maps to enlarge for better viewing. Yesterday's post about the February 1759 Prussian raid into Poland to destroy Russian supply depots really needed to have a map in order to follow the action. 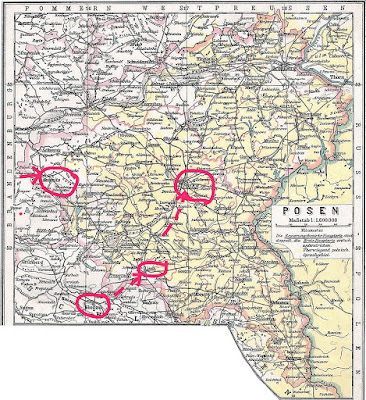 So this post rectifies that by adding an annotated map of the Silesia-Posen area. The annotations circle the towns mentioned in the Lloyd account and I added some dashed lines to indicate the path of the raiders. I would speculate that there would have been one or two battalions of grenadiers in Wobersnow's infantry forces. I could read the number of cannon that were taken on the raid because my facsimile copy-reprint has a big old black ink smudge over the area that provides the number of cannon. I would speculate that two 6-pounder cannon would accompany the task force. The Lloyd account merely mentions that Kramachokow had a "considerable corps" that probably included a large number of Cossacks. 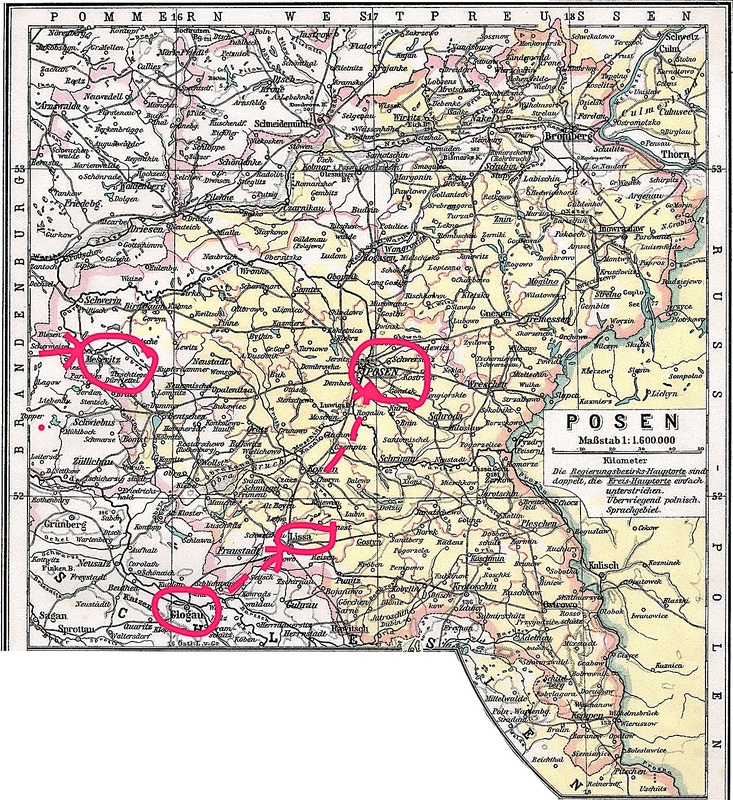 However, Kramachokow was headed towards Pommerani and New Stettin, which is well north of Posen. Another detachment of cavalry commanded by Colonel Dalcke is mentioned as travelling on the road to Posen to intercept or scout the raiding force. I think that a fun little scenario could be devoloped using this information. This & the previous post with the extract from Lloyd are certainly interesting. Perhaps you can work up a Teaser Scenario that could be published in The Wargamers' Annual? I'm sure CSG would greatly appreciate this, or perhaps even for one of the Refighting History books? Cheers, Rohan. Thanks for sharing. So many scenarios are for large batttles in the SYW. I like to see more smaller scenarios like these. Fun evening game with friends.